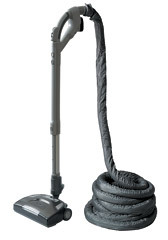 Beam Q Powerbrush & 30ft Soft Touch Full Swivel Electric Hose standard or direct connect. Ergonomic Beam Ultra handle and on-board tools which include a dusting brush and crevice tool that attach to the handle and an additional upholstery brush and 14" floor brush. Includes a quilted hose sock. Telescopic wand with integrated cord management and quick release neck. This product may only be shipped withing 100 miles from the store.